Home » Meat » Bacon » What’s For Dinner? 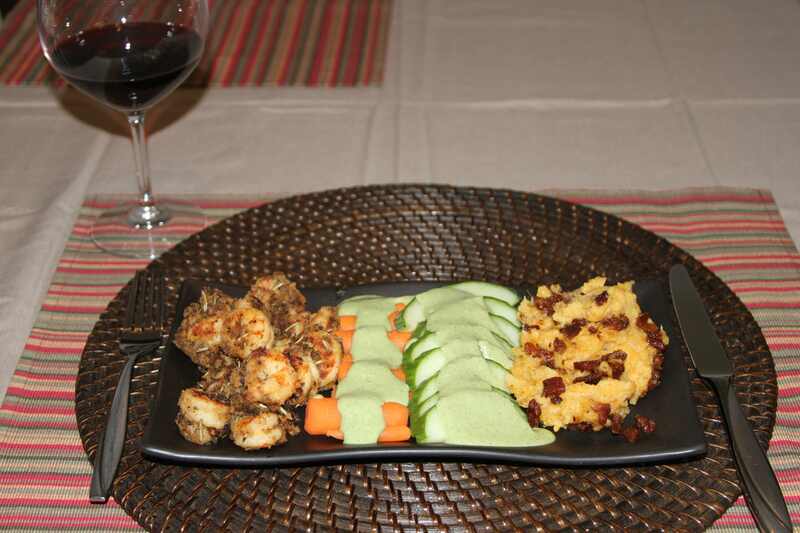 Pulling together 3 of my urbanpaleochef recipes: White Wine Coconut Shrimp as the protein, Cilantro Sauce on carrots and cucumbers as a side, and Bacon Mashed Sweet Potatoes as the other side. It’s a mostly quick meal to make, if the cilantro sauce is made ahead of time. Total cook time for each side will turn out to be approximately 45 minutes, and they can cook together on the stove (provided you have a 4-burner stove). White Wine Coconut Shrimp. The white wine coconut shrimp is a great meal centerpiece. It’s sweet, savory, and anyone who can eat shrimp will love it. It is extremely versatile as a main dish, and goes really well with almost any side you want to prepare. And they’re pretty easy! For my white wine I went with a pinot grigio. I have a good selection, including the pinot grigio, a few riesling, some chardonnay, and some desert wines, so my variety of choice also breeds a variety in flavor on the other side of the meal. Typically I will go for a dry, fruity riesling, but today I wanted a more bold fruit flavor, and chose the pinot grigio. I will also enjoy drinking that over the next several days. Bacon Mashed Sweet Potatoes. Bacon sweet potato mash is an amazing side dish. This dish really speaks for itself. I brought it to a holiday party once, and it was cleaned out before I got a chance to get any! Like the shrimp, anyone who eats bacon will love this dish. And like the shrimp, it’s simple and easy to make, and doesn’t take too long. Cilantro Sauce, steamed carrots, sliced cucumbers. The cilantro sauce is a bit more of a challenge, and takes some time to put together, but it’s great if you can get it ready in the morning for an evening meal, or have some left over from the last time you made it. It keeps really well, and tastes every bit as good the second time you eat it as it did the first time. As I’ve mentioned in the cilantro sauce recipe page, it can be easily used on fried yuca or fried sweet potatoes. But I chose to go with the carrots and cucumber for a couple of reasons: 1. I love cucumber and always look for excuses to eat it. 2. I think the flavor of cucumber and carrot are strong enough to make the cilantro a side in this dish, rather than being overpowered by it, and allowing the cilantro sauce to take over the dish. Use it sparingly, no matter how you use it, it can be quite strong. Also, as an alternative to the recipe on my page: if you use macadamia nut butter, 1/4 the garlic, and a little extra coconut butter, it can turn out to be a very creamy treat for a dip or salad dressing. It will thicken when it cools in the fridge though, so serve it at room temperature. Put the greens on the plate first, pouring the cilantro sauce over them generously, but be careful. You won’t want the sauce to inadvertently mix with the mash or the shrimp. Next add the bacon mash to the side. Finally, add the shrimp. I suggest adding the shrimp last, because it’s best when served hot, so the longer it sits in the pan, the more heat it will retain. Now serve! Look out for my Urban Paleo Chef meal suggestions in my “What’s For Dinner” posts daily, or archived on my What’s For Dinner page! Set a nice glass of your favorite red wine, and sit down for a delicious meal! As a note: red wine doesn’t generally go well with shrimp meals, but this way of doing shrimp is perfect for a fruity red.